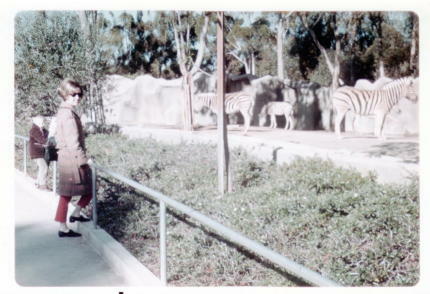 The time was January 1969 and the place was the San Diego Zoo. I’m wearing one of those plain cloth coats so hard to find today–it was a “tasteful” plaid of browns and tans with shades of orange throughout that matched my knitted 1960’s style capri pants so well. It sported a casual tie belt for added style. The temperature was around 70° and I’m sure I didn’t need a coat at all. But it matched my slacks! I didn’t buy the slacks in a clothing store, but at a “clothes party” given by an acquaintance at her home. The party hostess’s efforts were awarded with a percentage of her party’s sales in free clothing, hence their popularity. You went to the party, tried on as many clothes as you liked, ate lots of snacks and gooey desserts, placed your order with a small money deposit and then went home. A week or two later the two pairs I ordered arrived, the pair I’m wearing in the picture and other brown ones turned out to be very nice indeed, even if they were a little more expensive than a pair from the cheaper clothing boutiques. They were very comfortable, and both pairs matched that cloth coat so well that winter while I explored Pittsburgh with my then-best-friend, and a few months later (in May) Hubby ;). My boss, Mr. G, a colleague named Tom, and I had been sent to a meeting in San Diego held on–I wish I could remember exactly where but can’t–an island enclave of sorts where there was a Yacht Club. I don’t know how exactly we were privy to such luxurious accommodation, but I remember a taxi ride from the airport that took me along a shoreline dotted with luxury yachts where an attendant at a guarded gate checked a list for my name. I was agog at the very exotic location and the even more exclusive-looking hotel, by far the fanciest place I’d ever stayed. When I went to check my reservation and get my room key, the clerk looked up at me as I gave him my name, and said he’d been wondering who I was because he had a slew of telephone messages for me. It turned out that one of the standards committee members I’ll refer to hereafter as Barry (not his real name) had been waiting for me to arrive. I was a few hours late due to missing my flight from San Francisco where I’d spent the weekend visiting Hubby’s brother who showed me around SF, Oakland and Berkeley while I was enroute to San Diego. I was 26. Barry was a whole lot older than me, between his late 40’s to mid 50’s I guessed. We’d met the previous fall at an conference at a Hilton Hotel in Manhattan. If I’d been as worldly then as I fancy myself to be now, I might have explained to the clerk that I was Barry’s speech therapist. I was still somewhat fresh from the south, and living for the second year in Pittsburgh, with a new job that gave me the opportunity to do a little traveling with a paid expense account. A sharecropper’s daughter with little formal education could hardly expect any more than that, even if the pay was lousy. For the times, at $500 with a raise after three months instead of the $325 I’d pulled in at Carnegie-Mellon University the year before, it was more money than I’d ever earned before. Barry was a stutterer. The more impatience his listeners exhibited because of his handicap, the worse he’d stutter. I had been raised to be especially respectful to my elders, and I’d had plenty of practice learning to talk comfortably with foreign students who knew limited English at my old job at the University of Florida, so I was able to listen patiently and look him in the eye when he stuttered at me. I soon noticed that after we talked awhile he’d begin to relax and become easier to understand and carry on a conversation with. So, even though I found our encounters slightly stressful, I was careful not to avoid conversation with him. After that initial meeting, aside from an occasional letter or ‘phone call about a publication with which he was involved, I had barely thought of him at all. I’d just arrived in my room and closed the door behind me to check out my home for the next few days when the telephone rang. Barry had checked into the hotel much earlier in the day, even though he had a home in San Diego with a wife and kids. He was eager to show me around it seems. He had driven his car, and since the meetings didn’t officially begin until tomorrow, he wanted to show me around town, specifically to take me to the San Diego Zoo, the most famous and best zoo in the world he assured me, an attraction not to be missed! And it was, at least it was the best zoo I had ever been to, including the Pittsburgh Zoo, which was a cut above the old Jacksonville (Florida) zoo, the only other zoo I knew. I’d always felt sorry for the animals there–holed up as they were–in stinking cages with humans gawking and poking through the fence. The San Diego Zoo was the first open air animal exhibit I’d ever seen, where the animals roamed free in a naturalized setting while the people remained behind bars. I loved it! To this day, it’s still the best zoo I’ve ever visited, I think. I remember that day I very badly wanted to visit the elephant enclave. 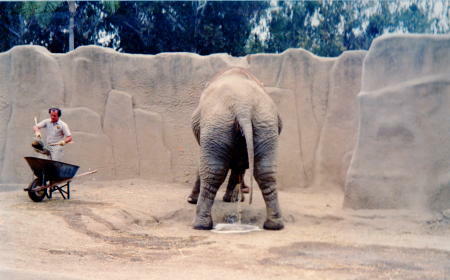 In 1962, after I had seen HATARI, I promised myself if I were ever near a baby elephant in a zoo, I would take a photograph of it from the rear. Few things had ever captured my imagination quite as much as those hind shots in the scenes from the movie where the baby elephant keeps getting into trouble and trotting along behind bigger elephants–his tail twitching from side to side in time with the musical theme Henry Mancini had written for the film. I don’t quite understand why I was so determined to do that, but there I was–at the biggest zoo I’d ever seen in my life and there was a new baby elephant there. In those days of expensive 36 mm film that came in 24 or 36 print capacity and cost a good bit of money shoot with, added to that the cost of developing and per picture printing, I was mindful not to use too many shots on any one subject; there were hundreds of other animals. So many photo ops. So little film! I had absolutely no luck getting the elephants to turn their south ends northward, the two or three I remember including the baby, no matter how hard I coaxed and cajoled. So I went home without the hoped-for baby elephant hind end picture. Later on back in Pittsburgh I told a friend and ISA colleague about my annoyance with rich old married men, plus my failure at photographing the baby elephant’s behind. She commiserated with me and I forgot about it in time. Years later, after I was married with a kid and living in Connecticut, I opened my mailbox and pulled out a large manila envelope. That same Pittsburgh friend I’d comiserated with a few short years before had just returned from her own visit to the San Diego zoo. Even though the baby elephant had grown a bit by that time, she had sent me an 8×10 photograph I’m very pleased to be able to share with you now here in Wintersong. It hung for 30 years or more in one or another room in our homes over the years, even doing time in offices and dorm rooms for many of them. It’s now is back where it belongs–on my office wall. It was even better than the one I’d hope to capture. This entry was posted in Animals (are people too), International Travel, Musings, Personal, sunny side of life by Alice. Bookmark the permalink. Look at that. Not only do you capture us with a wonderful story of romance, staying at the Kona Kai Club on Shelter Island, but you show us the hind end of an elephant in action. What a good friend Mary Lou is for making sure you got that picture! Boy, that picture is a family favorite! Yes, I used to be 145, then 165, then 178. I shan’t tell you how gigante I have ballooned to. Darn it. I wanted you to know that I have changed my note page. Do let me know, at your convenience of course, if it works better for you. The time was January 1969 and the place was the San Diego Zoo. A few years later and you might have run into little-girl me, there. In 1969 I moved to California and my grandparents bought a house in Oceanside. I remember the San Diego zoo as being the highlight of my visits!